NASA has yet to set a firm launch date for the final flightof space shuttle Discovery, after an hours-long meeting today to review technicalissues that have grounded the orbiter for over a month. Top shuttle program mangers met today (Dec. 2) to evaluatethe repairs that were made to Discovery's massive external fuel tank. Engineering teams at NASA's Kennedy Space Center in CapeCanaveral, Fla. have been compiling data in order to determine the root causeof cracks that were found on the metal ribs of the shuttle's external tank. Fromtoday's discussion, officials held off on assigning a firm launch date for Discovery'sfinal mission to the International Space Station. "They came out of the meeting saying, 'we need togather more information and we need more analysis,'" NASA spokesman AllardBeutel told SPACE.com. "They're still working on the initial cause. Thiswas a status update meeting rather than decision-making meeting." NASA had been aiming for a Dec. 17 launch for Discovery, butBeutel said shuttle mission managers are making decisions driven by data ratherthan a timeline. "We really don't have a new target launch yet ? we havenot had one since Nov. 5," Beutel said. "Here at Kennedy, we're doingthings to maintain Discovery'slaunch readiness to support a Dec. 17 liftoff, but that's really just thefirst available launch opportunity." NASA has a short window in which to try and launch Discoverythis month. 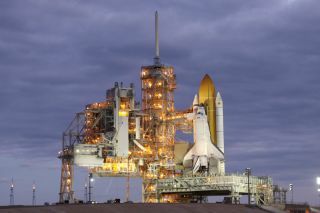 At the end of this month, the computers onboard the shuttleneed to be reconfigured to reflect the year change, and typically, NASA haspreferred to do this while the shuttle is safely on the ground or docked to thespace station. Discovery's STS-133 mission has already been delayed sinceearly November due to technical and weather-related issues. The shuttle'splanned 11-day mission will deliver a storage room and Robonaut2, a humanoid robot, to the International Space Station. Two spacewalks arealso planned. The mission will be the 39th and last flight for Discoveryand is one of NASA's two final scheduled shuttle flights before the orbiterfleet is retired in 2011. NASA is hoping to launch an additional shuttle flightaround June, but is still awaiting final funding approval from a congressionalappropriations committee. Still, Beutel emphasized that there are a lot of variablesthat could influence the decision-making process, and ultimately, the nextlaunch attempt will be set when managers are fully confident they understandwhat caused the problems with the shuttle's external tank. ? "It's not a clear cut process, but management is makingsmart decisions," Beutel said. "They're not being pressured by theschedule. It's all about when the data supports a launch."